MADRID (Reuters) - Staying fit is more important to Rafa Nadal in 2014 than adding to his 13 grand slam titles, the world number one was quoted as saying on Friday. Spaniard Nadal had one of the best season's of his career in 2013 following his return in February after seven months out with a knee injury, winning 10 tournaments including a record eighth French Open crown and a second U.S. Open title. As he gears up for the start of the 2014 tour, the 27-year-old Mallorcan told Spain's As newspaper remaining healthy and being able to challenge at the top level were his priorities. 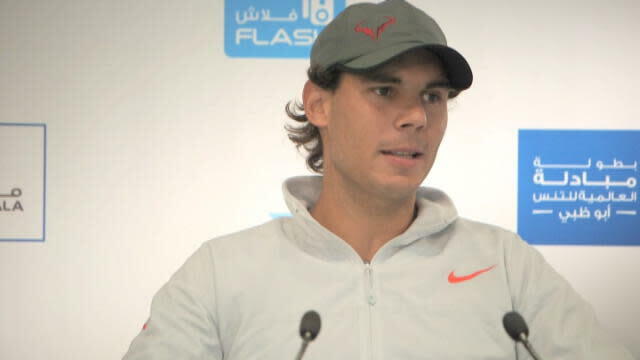 "What I want is to be able to start the year well and in shape to compete in the big tournaments," Nadal said. "In that sense, and thinking about 2014, I am not going to talk at the moment about winning the ninth Roland Garros or winning Wimbledon again, which would be the third time. "No, look: what is important to me is to maintain my fitness in a way that will allow me to play the whole year, and competing at a good level. "You see it's not easy: I couldn't do that, for the whole season, in 2012, 2013." Nadal's 10 titles last season came close to matching the best year of his career, when he won 11 in 2005, including his first Roland Garros crown. He said his enforced rest in the second half of 2012 had meant he was fresh and hungry on his return and that was possibly why he had been so successful. "In terms of results, I don't know if 2013 was the best year of my career," Nadal told As. "What made it special was the feeling of being able to compete again at the level I managed. "But certainly 2013 was the most emotional of my career. If you ask me about the key elements of what happened I think I started playing when I was fresher than ever after a seven-month rest. That may have been the key to the successes." Nadal will get his next crack at a grand slam when the Australian Open starts in Melbourne in mid January. He is playing compatriot and world number three David Ferrer at an invitational event in Abu Dhabi later on Friday.